Angiogenesis, the formation of new vessels, is found in Multiple Sclerosis (MS) demyelinating lesions following Vascular Endothelial Growth Factor (VEGF) release and the production of several other angiogenic molecules. The increased energy demand of inflammatory cuffs and damaged neural cells explains the strong angiogenic response in plaques and surrounding white matter. An angiogenic response has also been documented in an experimental model of MS, experimental allergic encephalomyelitis (EAE), where blood–brain barrier disruption and vascular remodelling appeared in a pre-symptomatic disease phase. In both MS and EAE, VEGF acts as a pro-inflammatory factor in the early phase but its reduced responsivity in the late phase can disrupt neuroregenerative attempts, since VEGF naturally enhances neuron resistance to injury and regulates neural progenitor proliferation, migration, differentiation and oligodendrocyte precursor cell (OPC) survival and migration to demyelinated lesions. Angiogenesis, neurogenesis and oligodendroglia maturation are closely intertwined in the neurovascular niches of the subventricular zone, one of the preferential locations of inflammatory lesions in MS, and in all the other temporary vascular niches where the mutual fostering of angiogenesis and OPC maturation occurs. Angiogenesis, induced either by CNS inflammation or by hypoxic stimuli related to neurovascular uncoupling, appears to be ineffective in chronic MS due to a counterbalancing effect of vasoconstrictive mechanisms determined by the reduced axonal activity, astrocyte dysfunction, microglia secretion of free radical species and mitochondrial abnormalities. Thus, angiogenesis, that supplies several trophic factors, should be promoted in therapeutic neuroregeneration efforts to combat the progressive, degenerative phase of MS. Multiple Sclerosis (MS) is an autoimmune demyelinating disease of the Central Nervous System (CNS) whose cause remains elusive. An inappropriate recognition of an autoantigen on myelinated nerve fibers recruits macrophages and lymphocytes in the CNS, leading to white and grey matter demyelination. Other pathological hallmarks of the disease are gliosis, axon degeneration and remyelination attempts. An altered Blood–Brain Barrier (BBB) permeability, with a subsequent transmigration of lymphocytes and mediators into the CNS, is an early event in the MS pathogenesis. Local breakdown of BBB has been demonstrated, as gadolinium-DTPA enhancement (gd.e.) on T1 weighted magnetic resonance imaging (MRI), to precede other clinical signs and to be a prominent event in disease progression ,. BBB incompetence has also been documented as an altered expression of endothelial tight junction proteins, changes of vascular basement membrane (BM) molecules and pericytes in acute and progressive MS forms –. Localized BBB disruption could precede the development of typical demyelinating lesions associated with inflammatory cuffs around veins or venules ,,,. However, macrophage infiltration also seems possible across a preserved BBB for humoral factors (marked by the absence of gd.e. ), as already demonstrated in MS , and EAE . The increased BBB permeability is primarily, but not only, driven by the release of Vascular Endothelial Growth Factor (VEGF)/vascular permeability factor , that also regulates vessel growth and is chemotactic for monocytes and lymphocytes, promoting neuroinflammation –. Other BBB permeability promoting factors such as interferon-γ (IFN-γ), tumour necrosis factor-α (TNF-α) and interleukin-1 (IL-1) have been described in MS [reviewed in 7] (Table 1). So-called sprouting angiogenesis, the formation of new vessels from pre-existing ones, is a strictly controlled process during tissue repair and regeneration to provide the necessary oxygen and nutrients for an area with increased cellular needs. Angiogenesis is a vital process in growth and organ development; it is active in developing human CNS  but quiescent in adult human brain . Endothelial cell proliferation and a consistent increase of vascular networks due to angiogenesis have been investigated and found in MS demyelinating lesions only by two groups , and much remains to be demonstrated about the regulation and significance of angiogenesis in MS. Increased angiogenesis is a common feature of several neurological conditions, with detrimental effects as observed in Alzheimer’s disease (AD) , Parkinson’s disease (PD)  and brain tumours , whereas a beneficial effect of angiogenesis has been proposed in cerebrovascular ischemic and traumatic brain injury . In MS lesions and in surrounding normal-appearing white matter (NAWM) and grey matter (NAGM), an angiogenic response has been suggested to contribute to disease progression  or, alternatively, to remission after relapses. Ever since the first descriptions of MS disease signs, the vascular component has been acknowledged as an important element to understand the disease pathogenesis –; breakdown of the BBB in MS lesions was first described by Broman . Acute and chronic demyelinating lesions and even NAWM of MS patients show blood vessels with a glomeruloid morphology , class II MHC antigen expression, intramural fibrin, hemosiderin, and collagen deposition, vessel wall hyalinization, evidence of thrombi and haemorrhages and iron accumulation , all features consistent with angiogenesis and endothelial cell proliferation ,. One explanation of the angiogenic response seen in NAWM may be an effect of the increased energy demand for impulse conduction along excitable demyelinated axons, together with a reduced axonal ATP production due to mitochondrial dysfunction, both inducing a chronic state of ‘virtual’ hypoxia in chronically demyelinated axons . Meanwhile, chronic inflammation itself is pro-angiogenic and, in turn, VEGF is a pro-inflammatory factor. A good animal model for MS is experimental allergic encephalomyelitis (EAE). It can be induced by immunization using antigens derived from myelin. These antigens elicit an acute demyelinating process driven by T cells and macrophages which can have a chronic relapsing course quite similar to MS. Several reports indicate early BBB breakdown in the CNS of EAE –. Increased vessel density has been documented in different experimental models, including EAE induced in the mouse ,,, guinea pig –, and Lewis rat during the relapse phase . 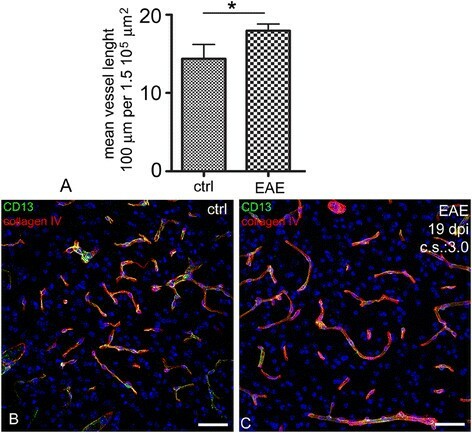 Figure 1 shows our results on EAE induced by MOG(35–55) immunization in C57Bl/6 J cerebral cortex vasculature, demonstrating an increased angiogenesis (cumulative vessel length) as compared to control mice. Vessel density is increased in EAE mice. A. Vessel density, calculated as the cumulative vessel profile length per standard area (ImageJ software, NIH, Bethesda, USA; observer blinded to section ranking: CC), is significantly increased in EAE brains at 19 days post-immunization (dpi) (ctrl: 12 week-old control mice, n = 5; EAE: 12 week-old EAE mice, n = 5; t-test, p = 0.0026). B, C. Representative images of the vasculature of the same cerebral cortex area (area frontalis) in healthy mice and EAE (mouse at 19 dpi after 200 μg of MOG35–55 immunization; clinical onset: 10 dpi, clinical score (cs) at 19 dpi = 3.0) are immunolabelled with CD13, a pericyte marker, and collagen IV of the vessel basal lamina. Some glomeruloid microvessels associated with a high number of pericytes are visible in the EAE brains. Boroujerdi and co-worker  demonstrated that vascular remodelling is an early process in MOG-induced EAE, because increased vessel areas and endothelial proliferation appeared evident as early as 4 days post-immunization (dpi), in a pre-symptomatic disease phase, while the onset of symptoms occurred around 14 dpi. In the EAE, VEGF is expressed by astrocytes, monocytes and activated Th1 lymphocytes, all contributing to BBB breakdown ,,. Other studies have confirmed increased angiogenesis, severe inflammation and activated VEGF signalling in inflamed lesions ,,,,. VEGF increases inflammation in those areas injected with exogenous VEGF in MBP-immunized animals . In addition, the expression of VEGF is demonstrated in dorsal root ganglion neurons and dorsal column axons in spinal cord, implying that it may act as a neuromodulator . During EAE, an increased neuronal VEGF expression has been described in the early phase but decreased expression in the late phase . Another study reported a decreased VEGF level not only in neurons but also in astroglia in a rat EAE experimental model . A VEGF decrease may be caused by neuronal dysfunction, as already demonstrated in epilepsy by McCloskey et al. . Astroglial production of VEGF is enhanced in pathological conditions, including human astrocytoma  and MS and EAE, to promote angiogenesis and glial survival . The striking differences of VEGF expression levels and cell sources among different studies could be explained by the use of different EAE models as regards immunization protocol, animal species and strain employed. Accumulating evidence indicates a role for VEGF in the pathogenesis of MS. VEGF-A, mainly secreted by astrocytes and neurons but also by cerebral endothelial cells and leukocytes, binds its receptors, VEGF-R1 and VEGF-R2, expressed on different cell types including endothelial cells, astrocytes, neurons, microglia, leukocytes ,,,,,,,. An elevated VEGF expression was detected in reactive astrocytes of both active and inactive chronic demyelinated lesions , in NAWM from post mortem MS brains , and in sera of MS patients during clinical disease relapses , and is correlated with the length of spinal cord lesions . VEGF, acting as a pro-inflammatory factor, can cause CNS injury. The effect of VEGF in other disease models could also shed light on the MS pathogenesis. In an ischemia-reperfusion model, inhibiting the activity of endogenous VEGF reduces the size of lesions , whereas exogenous administration of VEGF exacerbates CNS injury ,,. However, in experimental conditions, the administration of VEGF to the CNS can be beneficial or detrimental depending on the rat strain, VEGF dose and, especially, timing ,. In the late MS phase, VEGF-A, acting as a neuroprotective agent for neurons and neural progenitors, is decreased in the cerebrospinal fluid (CSF) of MS patients and also in peripheral blood mononuclear cells (PBMC) from secondary progressive MS (SP-MS) patients ,. In addition, reduced levels of VEGF are associated with EAE, as already mentioned ,,, and also with amyotrophic lateral sclerosis (ALS), a human neurodegenerative disease –. VEGF is released for neuroprotection purposes, enhances axonal growth and neuronal resistance to injury of cultured neurons , but at the same time it induces the dismantling of BBB tight junctions . VEGF-A is mitogenic for astrocytes , and reactive astrocytes play a pivotal role in the healing process after spinal cord injury . VEGF-R1 and R2 are upregulated on microglia and other antigen presenting cells after CNS trauma, suggesting a modulating role of VEGF in CNS immune surveillance . VEGF induces anti-inflammatory effects and downregulation of a broad set of inflammatory cytokines and chemokines in microglia/macrophages, and this immunosuppression is linked to the plasticity-promoting action of VEGF . But VEGF-A also recruits monocytes via VEGF-R1, inducing inflammation and BBB breakdown in rat brain , as well as being chemotactic for T-cells and macrophages . T cells express VEGF and VEGF-R2, fostering the transition toward the Th1 phenotype; an upregulation of Th1 lymphocytes in CSF has been observed in relapsing MS patients . VEGF-stimulated T cells also exacerbated adoptive EAE in rats . VEGF production is promoted by several pro-inflammatory cytokines such as IL-1β, IL-1α and IL-18 , and macrophages, too, are known to produce VEGF  and NO, further stimulating VEGF production and VEGF receptor expression by endothelial cells . VEGF-R2 is also expressed on endothelial cells in active MS lesions , possibly contributing to produce an increased vessel density and endothelial proliferation. In response to VEGF, activated endothelial cells down-regulate Cx43 gap junctional communication  and increase the expression of cell adhesion molecules such as PECAM-1/CD31, VCAM, ICAM-1, MIP-1α, MHC I and II, Selectin , activating a loop that boosts neuroinflammation and angiogenesis. Thus, the surprisingly multiple effects of VEGF in CNS can be reconciled, considering that VEGF splice variants could result in opposite effects due either to binding with different affinity VEGF-Rs and Neuropilin-1 or to differential tyrosine residue phosphorylation of VEGFRs ,. Hypoxia inducible factor (HIF-1α) dimerizes with HIF-1β and the complex translocation to the nucleus promotes VEGF transcription . The VEGF-A gene contains a hypoxia responsive element that binds HIF-1α . An increased expression of HIF-1α was demonstrated in MS lesions showing histopathological features of hypoxic tissue damage . HIF-1α is also increased in EAE mice, together with other genes involved in cell migration across the BBB . Platelet-derived growth factor (PDGF) and basic fibroblast growth factor (bFGF) contribute to angiogenesis  and oligodendrocyte progenitor growth and differentiation after demyelination . Serum levels of bFGF were significantly increased in MS patients, while PDGF showed no significant change . Inflammatory molecules found in MS, including IFN-γ and TNF-α, are also pro-angiogenic factors . Endothelin-1 (ET-1) is another pro-angiogenic factor that is significantly elevated in MS patients , and antagonizing the ET-1 receptor ameliorates acute EAE . Angiopoietin-2 (Ang-2) is increased in neurons, glia and inflammatory cells during EAE ,. Endothelial α5β1 integrin, involved in endothelial proliferation in hypoxic conditions , is transiently upregulated in EAE . Gene expression analysis of the laser-captured microvascular compartment of active lesions from MS autopsy samples has shown an increased expression of matrix metalloprotease-14 (MMP-14), MMP-2, ADAM17, VEGF-A, and VEGF-R1 . Other inflammatory mediators such as TNF-α, IL-8, transforming growth factor-β (TGF-β), and MMP-9 released by immune cells induce angiogenesis  and, in turn, new vessel walls are easily permeable to immune cell transmigration and foster adhesion and cytokine molecules expression . Compelling evidence shows a coordinated interaction between the nervous and the vascular systems during development and in adult brain . This interaction is responsible for the creation of a specialized perivascular microenviroment called the neurovascular niche, in which neural and glial progenitors develop, proliferate and differentiate. Adult neurogenesis primarily occurs in the subgranular zone (SGZ) in the hippocampus and the subventricular zone (SVZ) of the anterior horn of lateral ventricles. During regeneration, as well as during development, angiogenesis and neurogenesis are closely related; the molecular mediators of neurogenesis and angiogenesis overlap and cell-cell signalling between brain endothelium and neural precursors sustains ongoing angiogenesis and neurogenesis ,. This crosstalk is mediated by soluble signals secreted mainly by endothelial cells ,. These molecules, affecting both neural and vascular function, have been called ‘angioneurins’ , classified as angiogenic molecules, morphogens and growth factors; in the latter group the prototypical factor is VEGF. Endogenous VEGF, abundantly secreted by the ventricular neuroepithelium, regulates neural progenitor proliferation, migration, differentiation and the composition of neurons . In adulthood, VEGF signals transmitted by VEGF-R2 and R3 enhance cell proliferation in the SVZ and SGZ by induction after voluntary motor activity . Several findings implicate VEGF as a neuronal survival factor via VEGF-R1 signalling , and also a factor promoting oligodendrocyte precursor cell (OPC) survival and migration during axon guidance, thanks to VEGF-R2 and R3 expression . Both angiogenic and neurogenic responses to VEGF are attenuated in the aged mouse brain . Finally, VEGF may impact neuro-vascular interactions through alterations of the extracellular matrix molecule (ECM) composition, particularly of integrins and their ligands  and of SDF1/CXCR4 expression . This ligand/receptor interaction is critically involved in OPC differentiation and remyelination in a model of toxic demyelination . The ECM of vascular endothelial cells can trap FGF-2 (bFGF), which facilitates neurogenesis  and promotes OPC migration to demyelinated lesions . Epidermal growth factor (EGF), pigment epithelium-derived factor (PEDF) and TGF-α have been implicated in adult neurogenesis and oligodendrogenesis ,. EGF and FGF receptors co-activation is required for the maintenance of neural stem cells (NSCs) and progenitor cells in the adult SVZ ,. However, prolonged exposure to EGF induces oxidative neuronal death and astrocyte commitment from NSCs  and a higher secretion of EGF has been demonstrated in PBMCs of patients with relapsing remitting MS (RR-MS) . Neurotrophins such as nerve growth factor (NGF) and brain-derived neurotrophic factor (BDNF) reciprocally promote angiogenesis ,, and higher amounts of both have been detected in CSF from MS patients ,. BDNF and its receptor tyrosine kinase (gp145trkB) have been involved in immune-mediated neuroprotection in MS lesions ,. In other situations, vessels act as guidance templates for axons, releasing guidance cues such as VEGF, artemin, neurotrophin-3 or ET-3 . VEGF-Rs cooperate with the Notch pathway during vascular patterning and also neurogenesis . Notch-1 and Notch-4 receptors, as well as Jagged-1, delta like 1 (Dll-1), and Dll-4 ligands of Notch, are expressed in endothelial cells . In adult brain, the Notch pathway is expressed in SVZ and SGZ NSCs and regulates the maintenance of an undifferentiated state . In addition, Notch–expressing NSCs are closely juxtaposed to local blood vessels, and able to directly bind Dll-4 and Jagged-1 exposed on the endothelial cells, where a decreased pericyte coverage exists . MS demyelinated lesions contain Notch-expressing OPCs and modulation of the Notch pathway in EAE enhances remyelination and clinical recovery . Wnt/β-catenin and Sonic HedgeHog (SHH) morphogen signallings both regulate embryonic neurogenesis and angiogenesis , and are variably associated with the remyelination process  and BBB integrity . Nogo-A is an axonal growth inhibitor, and negative regulator of CNS angiogenesis ; anti-Nogo IgGs have been shown to suppress EAE through an immunomodulatory activity and the removal of remyelination obstacles between axons and new myelinating membranes . Netrin-1 is a matrix-bound molecule interacting with different receptors (UNC and DCC, certain integrins, DSCAM - Down’s syndrome cell adhesion molecule and adenosine receptor AR2b) involved in axon guidance and angiogenic blood vessel guidance [reviewed in 91], that has been shown to inhibit migration of oligodendrocyte precursor cells into the demyelinated lesions . Ephrins and their Eph receptors are short range axon guidance molecules, expressed in developing vessels and critical for their maintenance [reviewed in 91], that have shown different expression profiles in several CNS cytotypes of MS patients . The specific receptor EphA4 has been implicated in the onset and a more severe course of EAE, probably due to increased axon damage during demyelination . Also semaphorins and their receptors, plexins and neuropilins, regulate both axon guidance and angiogenic vessel branching and extension [reviewed in 91], and are crucially involved in remyelination failure in MS ,, dysregulation of T cell responses and the maintenance of tolerance in EAE ,. Ang-1 and −2 also play an angiogenic role, together with VEGF, during blood vessel formation and stimulate proliferation and migration of neural precursor cells (NPCs) ,. The expression level of Ang-2 is increased in RR-MS patients sera (Table 1) and in EAE mice spinal cord ,. Erythropoietin (EPO) promotes angiogenesis, VEGF secretion and VEGF-R2 expression on the cerebral endothelium and also CNS neurogenesis, directly via the EPO receptor and indirectly via BDNF-increased secretion and/or suppression of cytokine signalling . The relevant neuroprotective, proangiogenic and anti-inflammatory potential of EPO in MS/EAE is discussed below. In addition, oestrogen and androgen promote angiogenesis and neurogenesis after CNS injury ,. EAE studies with various sexual hormones or estrogen receptor (ER) ligand treatments led to clinical disease protection, as well as protection against CNS inflammation, demyelination and axonal loss [reviewed in 138]. ERβ ligand may not only prevent demyelination, but also promote remyelination . In a pathological situation (stroke), nitric oxide (NO) has a dual role in promoting angiogenesis and neurogenesis , and its action is closely linked to VEGF and BDNF expression in endothelial cells . Recent studies have revealed that a hypoxic gradient is an adequate stimulus to foster angiogenesis and neurogenesis, upregulating HIF-1 . Somatic stem cells reside within hypoxic niches, where low oxygen prevents oxidative stress and premature differentiation . Moreover, NSCs have been observed to migrate to brain regions where active angiogenesis is occurring in neurological diseases , creating a temporary vascular niche where the angiogenesis and neuroreparative processes are reciprocally fostered . In the context of mutual relationships between different cells of the neurovascular unit, endothelial cells of microvessels have shown to provide trophic support for OPCs . During development, OPCs migrate from the ventricular zone to their destination and then differentiate into myelinating oligodendrocytes. OPCs are also widely distributed in adult human brain and MS lesions  and are guided to repair demyelinated axons . Endothelial cells actively support the maintenance of OPCs, acting directly through endothelin B receptors expressed by OPCs . Several growth factors, such as PDGF-α, bFGF, hepatocyte growth factor (HGF), are known to induce proliferation and differentiation of OPCs, but VEGF produced by cerebral endothelial cells has a unique migration-promoting effect on OPCs . Thus, VEGF is a biphasic mediator in the neurovascular response to demyelinating injury; during the early inflammatory phase it promotes BBB permeability, and in the chronic phase, accelerates not only angiogenesis, neurogenesis but also oligodendrocyte lineage plasticity and repair. In fact, exposure of endothelial cells to sublethal levels of oxidative stress abrogates their support of OPC viability  and this could explain why OPC differentiation into myelinating oligodendrocytes seems to be blocked or ineffective in MS. Additionally, in response to injury, activated astrocytes release bursts of ATP and induce hypertrophy of their vascular endfeet . This locally increased ATP and decreased oxygen potentiates NSC expansion by upregulating VEGF, EGF, FGF-2 and NO  but delaying differentiation. Angiocentric perivascular demyelinated lesions show local inflammation also in the proximity of the lateral ventricles SVZ, and the effects of released inflammatory mediators on the neurovascular niches may be profound in this area, that is one of the preferential locations of demyelinating inflammatory lesions in MS . Persistent brain inflammation, induced by immune cells targeting myelin, extensively alters the proliferative and migratory properties of SVZ-resident stem cells (NPCs and OPCs) ,, and could justify the limited repair mechanisms observed after a long disease duration in MS patients (Figure 2). In addition, MS CSF contains a panoply of humoral signals that could interfere with the ependymal cells and consequently the subependymal neurogenic cells . Hypothetical model of Neurovascular Unit function (NVU) (A) and dysfunction in an acute MS lesion (B) and a chronic end-stage lesion (C). (A) Composition of blood–brain barrier (BBB)-provided microvessels, formed by endothelial cells which are connected by tight junctions (TJ), pericytes, astrocyte endfeet, and a continuous layer of basement membrane (BM). Neurovascular coupling is brought about by astrocyte processes which remove excess K+ ions at active synaptic spaces and release these ions into perivascular spaces; at the same time Glutamate (Glu) bound to astrocyte receptors can increase astrocytic Ca++ levels and produce vasodilatatory substances. Microglia and oligodendrocyte precursor cells (OPCs) contribute to NVU function. (B) An acute MS lesion, dominated by high levels of VEGF and other angiogenic molecules, shows BBB leakiness, vasogenic swelling of BM and disrupted NVU interactions: claudin-5 and occludin, two TJ proteins, are mislocalized and downregulated; the BM is degraded by MMPs, mainly released by leukocytes infiltrating vessel BM; microglia are activated and release large amounts of pro-inflammatory mediators; astrocyte endfeet are detached from pericytes. Activated B lymphocytes release self-targeted antibodies damaging myelinated axons. (C) Chronic end-stage MS lesion dominated by hypoperfusion, and persistence of an inflammatory milieu with abundant reactive oxygen species (ROS), peroxynitrite (RNS) and stress-associated proteins, all together inhibiting the net pro-angiogenic activity. The drawing shows pro-inflammatory microglia and also the influence of demyelination on reduced axonal activities, decreased vasodilatatory stimuli and consequent vasoconstriction. Hypoperfusion is also due to vessel wall hyalinization, collagen deposition and astrocyte endfeet hypertrophy. 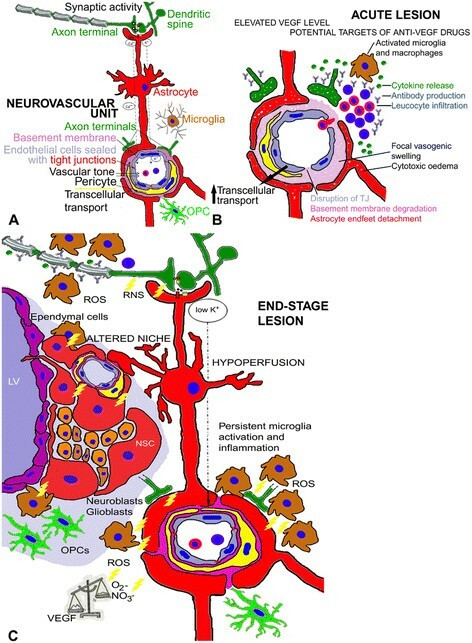 Persistent inflammation is also responsible for endothelial-derived protective molecules and growth factors downregulation which, in turn, maintains neural stem cells (NSC) in a resting state and impedes neuroblast and OPC maturation in the neurovascular niches in the subependymal layer of the lateral ventricle (LV) and in other neuroregenerative sites around blood microvessels. Positron Emission Tomography (PET) and Single Photon Emission Computed Tomography (SPECT) studies have shown a decreased cerebral blood flow (CBF) in grey and white matter of MS patients ,. Non conventional magnetic resonance (MR) techniques, such as proton MR spectroscopy and magnetization transfer resonance, have demonstrated diffuse pathological changes affecting both NAWM and NAGM in MS patients. Perfusion weighted imaging showed a significant CBF reduction and prolonged transit time throughout the NAWM of a group of RR-MS patients , and also involving NAGM . Furthermore, CBF and cerebral blood volume (CBV) were reduced in primary progressive (PP-MS) patients ,. A decreased blood flow has been speculatively proposed as a cause of leukocyte infiltration crossing the venule wall of WM  but CNS hypoperfusion could actually be a consequence of disease progression. Acute lesions visible as local gd.e. areas on T1 weighted MRI were characterized by increased CBF and CBV ,. However, more evolved MR parameters for nervous tissue angiogenesis such as time-dependent changes in 1/T1 (R1), used to form maps of blood-to-brain transfer constant of Gd-DTPA (Ki), ICAM-1 micron-sized particles of iron oxides, in addition to magnetization transfer parameters such as T1sat and kinv, could be used to further investigate MS angiogenesis in vivo. Our opinion is that BBB incompetence, demonstrated by gd.e., could reveal the same MRI sign both in early, immature angiogenic microvessels and in inflamed venules. In fact, possible evidence of the presence of angiogenesis in MS could be the appearance of “ring enhancement” at the periphery, but not in the centre, of chronic active lesions during contrast-enhanced MRI . Nevertheless, ring enhancing lesions are unusual in progressive MS and, in general, gd.e. is able to detect venular BBB incompetence in acute MS lesions containing both early angiogenic vessels and infiltration of immune cells. Chronic lesions and the remaining NAWM and NAGM appeared hypoperfused due to a reduced axonal activity , with a lower K+ release in the periaxonal and perivascular space, reduced astrocyte metabolism  and reduced arteriolar vasodilatation  (Figure 2C). In this context it is not surprising to find elevated VEGF signalling , increased vessel density and angiogenic endothelial cells in MS chronic demyelinated lesions and NAWM  as a frustrated attempt to overcome the chronic hypoperfusion. In short, angiogenesis and an increased vascular blood flow could dominate the early inflammatory phase of lesion formation, whereas, despite an increased vessel density, hypoperfusion could characterize the late degenerative phase, featuring a limited efficiency of endogenous neuroprotective mechanisms, by which angiogenesis, increased cerebral blood flow and neurorepair should be further promoted. This notion could be extended, since raised perfusion was higher in the WM of RR-MS at onset, before therapy, whereas hypoperfusion was more prominent in the PP-MS group , consistently associated with axonal loss, minor inflammatory signs and resistance to the available immunomodulatory drugs . The role of hypoxia in inflammatory lesions of both MS and EAE may be compound, since chronic mild hypoxia (10% O2) has a beneficial effect in the acute and chronic phases in MOG-induced mouse EAE . This effect is due to the promotion of tissue survival but also to the modulation of immune mechanisms: pericytes produce anti-inflammatory eicosanoid prostaglandin D2, endothelial cells release TGF-β that promotes the differentiation of T regulatory cells, and astrocytes express HIF-1α . One of the most consistent differences in gene expression between secondary progressive (SP-MS) patients and healthy controls was enhancement of HIF-1α and its downstream components . In this specific inflammatory condition, the increased effort of HIF-1α and VEGF promoting angiogenesis/arteriogenesis and normalizing oxygen levels to maintain oligodendrocyte and neuron functions could be counterbalanced by other molecules, such as reactive oxygen species (ROS) –, nitric oxide intermediates and peroxynitrite (RNS) . These molecules could be responsible for mitochondrial dysfunction , distal oligodendropathy , apoptotic-like cell death and axonal injury . In MS patients, these pathologic mechanisms are associated with astrocyte dysfunction –, which could explain the arteriolar vasoconstriction in the presence of high metabolic demands (neurovascular uncoupling), accounting for so severe a hypoperfusion state as to result in hypoxia, and ultimately responsible for disease progression. In fact, the level of VEGF expression in resident astrocytes and neurons appears increased in progressive MS patients ,, as well as in RR-MS , and a reduced level of VEGF has been detected only in non-resident mononuclear cells in CSF and peripheral blood ,. This latter evidence could be compatible with the hypothesis of a true histotoxic hypoxia, as well as the observed lactate increase in CSF and serum of MS patients ,. Another important pathogenic aspect of chronic progressive MS could be mitochondrial dysfunction, aggravating the nervous tissue distress caused by hypoxic injury . Inflammatory cells (especially macrophages and activated microglia) releasing ROS and RNS ,, provoke clonally expanded mitochondrial DNA deletions responsible for respiratory chain defects detected in MS patients , and a consequently inevitably decreased ATP synthesis. Finally, cerebral hypoperfusion in MS patients might be aggravated by ET-1 ,,, together with alterations in the renin-angiotensin-aldosterone-system detected in MS patients such as decreased CSF angiotensin II levels , increased serum angiotensinogen converting enzyme  and up-regulation of angiotensin II receptor type I on myelin-autoreactive CD4+ T cells and monocytes of MS brain lesions . Although angiogenesis is likely not the first event in the pathogenesis of MS, its changing role in the different phases of disease progression makes it an important and underestimated target in therapeutic options. The current concept of the natural history of MS refers to a combination of two phenomena underlying the two phases of MS, namely an inflammatory process in the remitting phase and a neurodegenerative process in the progressive phase. The secondary progressive phase of MS is primarily caused by axonal degeneration following demyelination. The potential advantages of inhibiting angiogenesis in the early phase of MS could stem from reducing the vascular supply of nutrients and inflammatory cells to the demyelinating lesions, halting the production of endothelial-derived pro-inflammatory molecules . This approach could be proposed only in aggressive acute relapsing MS, where immunosuppression could be associated with specific antiangiogenic therapy. Considering the central role of VEGF signalling in pathological angiogenesis during the early MS phase, anti-VEGF therapy should be highly beneficial in the aggressive MS-subtype. We will briefly discuss some of these strategies, but do not propose to provide an exhaustive review of the literature. Bevacizumab, a monoclonal anti-VEGF antibody approved for renal, ovarian, lung and mammary glands malignancies, that has been proven to ameliorate EAE , is now being tested in a clinical trial in a group of patients with neuromyelitis optica, an aggressive disease mimicking MS (ClinicalTrials.gov Identifier: NCT01777412). Nevertheless, experimental inhibition of VEGF signalling using another neutralizing antibody decreased angiogenesis and astroglial proliferation, but led to greater neurodegeneration in a model of stab wound injury of the CNS . In murine MOG-EAE, antagonizing VEGF-R2 with Semaxinib (SU5416) was effective only in the acute inflammatory phase of the disease, but not in the chronic, degenerative phase . In addition, Bouerat et al. demonstrated a high efficacy of several anti-VEGF-R2 analogues and pro-drugs in an EAE model. Systemic administration of cavtratin, a selective eNOS inhibitor that can abrogate VEGF signalling, reverted neurologic deficits in EAE mice . Bortezomib, a proteasome inhibitor, could be useful to treat MS considering its potent anti-lymphocytic and anti-angiogenic activity . Thalidomide, and its analogue lenalidomide, are known to inhibit TNF-α, VEGF and IL-6 production . Thus, the use of thalidomide in MS has been suggested, considering its protective action against endothelial damage induced by TNF-α ,, reduced leukocyte chemotaxis and phagocyte activity , inhibition of IFN-γ and IL-12 , co-stimulation of CD8+ lymphocytes . Thalidomide has been demonstrated to restore BBB tightness and to protect the CNS in two experimental models of brain toxicity . In the MOG-induced EAE model, N-(aminopropyl)-4-amino thalidomide is a promising therapeutic tool, able to reverse clinical and histological signs of EAE ,. Corticosteroids stabilize the BBB  and inhibit angiogenesis in tumours  and chronic inflammation  (Table 2). 1licensed for MS therapy by the European Medicine Agency (EMA) but rejected by the Food and Drugs Administration (FDA), USA; 2not licensed but used in clinical practice. IFN-β displays anti-angiogenic and BBB stabilizing properties ,,. Glatiramer Acetate (GA; copolymer 1), a mixture of synthetic peptides mimicking myelin basic protein, used as a first-line treatment option for RR-MS, inhibits a tryptophanyl-tRNA synthetase known to modulate angiogenic signalling ,. The selective adhesion molecule inhibitor Natalizumab, which binds integrin-α4 on endothelial cells and blocks the VCAM-1 driven transmigration of immune cells sensitized against myelin antigen from the vessel lumen to the neuropil across the BBB, precludes VEGF-induced angiogenesis ,. Fingolimod (FTY720), an immunomodulator that acts on sphingosine 1-phosphate (S1P) receptors, is the first oral drug approved for the treatment of RR-MS. Downmodulation of S1P receptor type 1 (S1P1) prevents the release of lymphocytes from lymph nodes into the lymphatic vessels and vascular recirculation to the CNS, reduces astrogliosis, restores BBB function, and inhibits angiogenesis during chronic neuroinflammation, also via inhibiting PDGF-B-induced migration of vascular smooth muscle cells –. Alemtuzumab, recently licensed for the treatment of MS, is a humanized monoclonal antibody directed against CD52, a protein that is widely distributed on the surface of lymphocytes and monocytes and is also an anti-angiogenic molecule . Teriflunomide, an inhibitor of the mitochondrial enzyme dihydroorotate dehydrogenase, which is critically involved in pyrimidine synthesis, inhibits immune cell proliferation but shows only an indirect antiangiogenic activity. Dimethyl fumarate is the active compound of BG-12, recently licensed for the treatment of RR-MS; its activity is predominantly mediated via activation of the nuclear 1 factor (erythroid-derived 2)–like 2 (Nrf2) antioxidant response pathway . BG-12 also modulates immune-cell responses, suppresses proinflammatory-cytokine production and inhibits angiogenesis  (Table 2). Immunosuppressive therapies (i.e. mitoxantrone, cyclophosphamide), used to revert the aggressive course of MS, also exert an anti-angiogenic activity ,. A chemotherapeutic agent, cladribine, effective but unsafe in MS, decreases the level of angiogenic factors . Mycophenolate mofetil is an immunosuppressive agent, sometimes used as a disease-modifying therapy for MS, that can stabilize aggressive MS patients, and shows an anti-angiogenic activity . Minocycline has been effective in EAE ; it is an anti-angiogenic drug in tumours , decreases VEGF and MMP-9 , and has been tested in combination with IFN-β (NCT01134627) and GA (NCT00203112) . To date, disease modifying drugs have been shown to have little impact on the natural course of the progressive phase of MS. The development of add-on treatments targeting axonal repair and remyelination and/or slowing disease progression through neuroprotection/neuroregeneration remains the most important goal in the clinical management of chronic progressive MS ,. As the endogenous neuroregenerative response can be suppressed by inflammation or exhaustion, delivery of neurovascular factors by mesenchymal, foetal or bone marrow-derived stem cells could increase endogenous repair, angiogenesis, neuronal and axonal survival and oligodendrocyte maturation and myelin synthesis. The multitasking vascular and neuroprotective effects of VEGF show promise for therapeutic use in neurodegenerative disorders such as ALS, PD, AD and, eventually, progressive MS –, when its harmful vascular side effects can be restricted. Intracerebroventricular delivery of recombinant VEGF protein improves motor performance and survival in a rodent model of ALS . In a stroke model, exogenous VEGF administration increases neurogenesis of the SVZ, only after 28 days, without concomitant angiogenesis, demonstrating that a specific VEGF isoform could protect neurons independently of the endothelial cell influence . In the EAE model, despite several reports of an improved clinical score after early VEGF inhibition, one study  demonstrated that pertussis toxin stimulated VEGF expression and that VEGF neuroprotection could be responsible for milder disease. VEGF may have different effects in different cell types depending on different splice variants . The endogenous splice isoform VEGF-A165b has shown a potent neuroprotective effect in hippocampal and cerebro-cortical neurons (mediated by VEGFR2 and neuropilin-1 co-stimulation) with no pro-permeability property ,. This isoform may be an interesting add-on therapy option against axon damage in progressive MS, with fewer adverse vascular effects. Another interesting approach could be to specifically inhibit vascular permeability without affecting the endogenous neuroprotective effect of VEGF. This approach has been successfully investigated in EAE mice using angiostatin , cavtratin , anti-microRNA-155  and needs to be replicated in humans. A protective effect of vitamin D on the risk of MS has been demonstrated  and several trials suggested beneficial effects of vitamin D supplementation. Vitamin D3 promotes angiogenesis in endothelial cell cultures . Atorvastatin, pravastatin and simvastatin have both anti- and pro-angiogenic activities depending on the dose, specific angiogenic stimulus, and angiogenesis mechanism in the specific disease local microenviroment ,. They have been tested as neurorepair attempts in several randomized clinical trials in combination with IFN-β and GA –. Because neurons, oligodendrocytes and blood vessels are involved in the pathogenesis of MS, it would be better to use the same compound to treat all involved systems. Apart from VEGF, other molecules can stimulate neurogenesis, oligodendrogenesis and angiogenesis. The first is thyroxine (T4), that can decrease EAE severity  increase NGF and promote neurogenesis and remyelination. Other potential treatment options in selected MS patients could be sexual hormones added to an immunomodulator . Among potential candidate compounds for neuroprotection/neuroregeneration and angiogenesis modulators in progressive MS, EPO appears very promising. EPO possesses properties that could address several of the pathophysiological mechanisms involved in progressive MS, being an anti-apoptotic and anti-oxidative molecule, promoting neurite outgrowth and axonal repair, neurogenesis, angiogenesis and BBB integrity (reviewed in ). In addition, EPO treatment could temporarily decrease iron stores within the CNS, possibly providing an additional beneficial effect in chronic progressive MS patients. Excess iron may have several deleterious effects on axons, including iron-catalyzed production of ROS and RNS causing oxidative tissue injury. Iron accumulation may also alter oligodendrocyte activities (reviewed in ). Recombinant human EPO treatment has already proven safe and effective in severely affected MS patients –. Testing in clinical trials of EPO variants developed to minimize the risk of thromboembolism is a promising research field. In MS as well as in EAE, CNS lesions and surrounding NAWM/NAGM are characterized by different vascular changes in the different disease phases. In the acute demyelinating phase, there is a complex balance between vessel modulators released by inflammatory cells and hypoxia of more distant nervous tissue from blood microvessels that could be affected by localized vasogenic swelling due to the VEGF-induced altered vascular permeability ,. A reduced axon activity could cause hypoperfusion and hypoxia also in the chronic disease phase (Figure 2). Blocking VEGF signalling and angiogenesis reduced clinical and pathological signs of disease in the early phase in an animal model of MS ,,,,. EAE model experiments have shown that hypoxic pre-conditioning reduced the clinical severity and leukocyte infiltration thanks to increased levels of VEGF, TGF-β, IL-10 ,. However, aberrant angiogenesis and localized regression of the microvasculature can contribute to brain hypoperfusion and neurovascular uncoupling . In this context, the timing of vascular remodelling and growth factors release could be crucial. In early demyelinating lesions, remodelling is harmful and exacerbates the disease. Nevertheless, in chronic disease phases, angiogenesis, and especially the neuroprotective properties of VEGF, might be highly beneficial. An alternative therapeutic agent for this neurodegenerative condition with a lesser influence on cell types other than neurons, and also lacking pro-permeability/angiogenic properties, may be VEGF-A165b ,. Angiogenesis, induced either by CNS inflammation or by hypoxia, provides trophic factors for tissue remodelling ,. In a chronic hypoxia model of cerebrovascular disease, angiogenesis proceeds in the absence of BBB leakage, being associated with increased tight junction protein expression ; this demonstrates that angiogenesis is not indissolubly linked to BBB breakdown. In addition, resolution of impeded angiogenesis in neural stem cell niches in the SVZ would increase oxygen levels and could also promote differentiation of oligodendrocyte precursors. Future therapeutic efforts should be based less on a total block of angiogenesis, and more on titration of the response to produce new vessels with a functional integrity. These therapeutic options could be promising for application in MS, even if the angiogenic component of MS has still to be fully explained. To determine whether there is a correlation between clinical benefit and levels of angiogenic molecules, studies comparing clinical signs and circulating angiogenic markers in treated or untreated MS patients over time are currently ongoing, together with studies exploring angiogenesis-promoting molecules versus antiangiogenic drugs in late stage chronic MOG-induced EAE. In addition, clinical trials exploring combination therapy with an MS subtype-oriented immunomodulator/immunosuppressive agent added to an angiogenic/neuroreparative molecule during the progressive phase of MS could be warranted. Prof. L. Roncali (Department of Basic Medical Sciences, Neurosciences and Sense Organs, University of Bari, Italy) is gratefully acknowledged for her critical review of the article. We thank M.V.C. Pragnell, BA, for linguistic help. FG and CC carried out the EAE experiments, the morphometric and statistical analyses; DR and MT conceived of the study. FG, CC, DR and MT drafted the manuscript. All authors read and approved the final manuscript.